Eleni Bakst ’17 has received a two-year Equal Justice Works fellowship, sponsored by the Ottinger Foundation, to establish a medical-legal partnership to benefit immigrant families and unaccompanied children and to augment medical and mental-health services available to immigrant families and unaccompanied minors on Long Island, where the medical-legal partnership will be based. Bakst will work with Human Rights First to incorporate input from physicians and mental-health professionals into the organization’s policy advocacy against immigrant and refugee detention through strategic communications, on-site study of family detention centers, a national conference of medical, legal, and mental-health advocates, and a report scheduled for release in 2019. She will also work to increase the numbers of medical and mental-health providers offering services to newly arrived children and families on Long Island, which has a large influx of immigrants from Central America. The perspective of these professionals is critical, Bakst said, both for assessing the long-term effects of detention on children and families and on individual asylum cases, where expert testimony vastly improves the chances of claims being granted. “Studies show that having a doctor describe to a judge the medical impact of someone being shot or showing an x-ray of a bullet lodged in someone’s body, or having a mental-health expert discuss the long-lasting impacts of a child or family’s ordeal [in their home country], compounded by the effects of a detention are very effective,” she said. Mental-health workers also can help children “to find their voices in a safe and protected way” if called to testify on their own behalf in asylum cases, she said. Statistics released by U.S. Customs and Border Protection show that 59,692 unaccompanied minors and teenagers were detained in 2016 fiscal year, a 49 percent increase compared to the previous fiscal year. A New York City native, Bakst traces her longstanding interest in human rights and the challenges faced by immigrants to her parents’ experiences; her mother and father fled Tunisia and Poland, respectively, because of threats posed to Jews. “Hearing their stories growing up, I was always inspired by their bravery,” she said. After majoring in international relations and affairs at American University and stints volunteering as an English teacher in Chile and in Amnesty International’s Human Rights Education Service Corps, and interning at the Department of Justice, Bakst taught English to adult ESL students for the Northern Manhattan Coalition for Immigrant Rights. She said she found familiar inspiration in her students’ stories of hardship and migration. 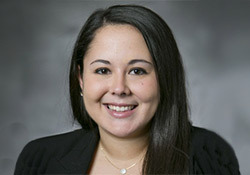 At Duke Law Bakst has pursued her goal of addressing domestic human rights issues through classes, clinics, summer public service work, and by organizing a Southern Justice Spring Break service trip to a federal immigrant detention center in Dilley, Texas, where she offered legal support to detained mothers and children who, if released, would likely file for asylum. The seeds of her fellowship proposal to Equal Justice Works and the March 2017 service trip were planted during her 2L summer work as a U.S. policy and advocacy intern in the Washington, D.C. office of the International Rescue Committee (IRC), Bakst said. The IRC was working to expand its advocacy into the field of unaccompanied children from Central America, Bakst said, and she was charged with developing a comprehensive packet of information on issues faced by that particularly vulnerable group. She credits her second-year work with fellow students in the Duke Law International Human Rights Clinic to investigate the effects of counterterrorism financing measures on women’s advocacy groups with giving her skills that will facilitate her fellowship goals. “My clinic team interviewed a number of government officials, U.N. experts, and nonprofit representatives in London, and learned, from [Clinical Professor] Jayne Huckerby and [Supervising Attorney] Sarah Adamczyk how to formulate questions to get relevant information, and how to work with people from different worlds and to translate all of that into a report.” The report, titled Tightening the Purse Strings: What Countering Terrorism Financing Costs Gender Equality and Security, was released by the International Human Rights Clinic and its partner organization, the Netherlands-based Women Peacemakers Program in March. Stella Boswell, who directs Duke Law’s Office of Public Interest and Pro Bono, commended Bakst’s “entrepreneurial spirit” in designing and shepherding her fellowship proposal through a rigorous application process. Bakst said the spring break she spent offering legal support to children and families incarcerated in Texas affirmed her post-graduate plans. Many of the women and children in the detention facility had escaped from domestic abuse, been “treated as property” in their marriages, and came from villages controlled by powerful gangs, she said.